The historic Ariston signs are down being restored. Join us when we Relight the Signs Saturday, May 4th just before sunset (8:05 pm central time). Music, vintage cars, light refreshments, guest speakers, all leading up to throwing the switch. Free outdoor event. Open to the public. Join us May 4th at the Ariston Cafe as we kick off the Route 66 travel season. When you're cruisin' down Route 66 in Litchfield, Illinois, and hunger strikes, take the time to check out one of the oldest American restaurants on the legendary highway. The Ariston Cafe opened its doors in 1924 and is one of the oldest continually-operational Route 66 restaurants still going today. Here, we offer a range of food including American, Southern, Italian, and Greek fare along with a fully-stocked bar in a clean, comfortable environment you're sure to enjoy. Our goal is to always provide top notch food and service. Stop in today and see what the Ariston Cafe has to offer you! 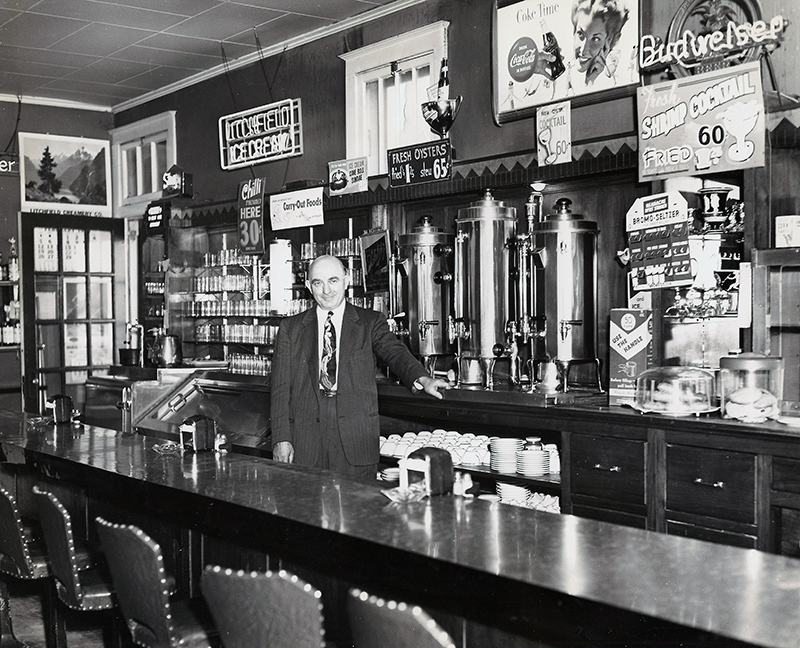 The Ariston Cafe was founded by Pete Adam, a Greek immigrant, in Carlinville, Illinois in 1924. The original cafe was located on Route 4, the predecessor of historic Route 66. In 1929, the Cafe was relocated to Litchfield, Illinois, and moved into its present location on Route 66 in 1935. We believe the Ariston Cafe to be one of the oldest, if not the oldest Route 66 restaurant. In 1992, The Ariston Cafe and the Adam family were inducted into the Route 66 Hall of Fame. In May 2006, the cafe was placed in the National Register of Historical Places by the State of Illinois and the National Park Service , United States Department of Interior. Since 1966, Pete's son Nick and his wife, Demi, have continued to offer the traditional service expected of a family-owned-and-operated American restaurant. In July 2018, the Cafe was purchased by the current owners Will and Michele Law and Marty and Kara Steffens, all from Litchfield. We look forward to continuing the cafes long tradition. Both of our families welcome you to Litchfield and invite you to share the Ariston Cafe history, and its' food, with us. local favorites at our restaurant. Tuesday, Wednesday, Thursday, & Sunday: 11:00 a.m. - 8:00 p.m. | Friday - Saturday: 11:00 a.m. - 9:00 p.m. Historic Route 66 Area from Chicago, IL. to St. Louis, MO.